1 Here Is Why I Started My Own Home Gym? 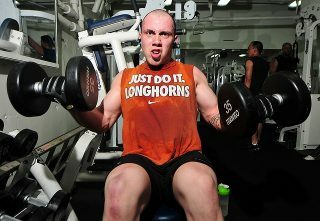 You would go out, buy a membership to some place or go to your high school, and start pumping iron. Maybe this idea got seared into my head from my football coaches or from watching too much TV, but either way it shaped my fitness for a long time. Here Is Why I Started My Own Home Gym? I show up and I’m already rushed because I’m doing this between classes and I’m trying to fit this in or I’m extremely tired because I woke up early to come do a workout. I walk in and smell that nauseating stench of rubber and sweat. I don’t mind sweating, but I’m not a fan of other people’s sweat. I look around and see a maze of different pieces of equipment. I venture over to the free weights because it’s open and quite frankly they’re the only things in here that I know how to use. I do a few curls while staring into a gigantic mirror feeling intimidated by the reflection of the juggernaut-of-a-man next to me. After that, I walk around for a bit trying not to make eye contact with anyone before finally deciding to hit the treadmill for a few minutes. I get on only to notice the mom before me has made it slippery with her perspiration. I jog for a few minutes and then remember that I have a huge assignment due the next morning. So, I hop off and head in for a quick shower with a bunch of naked old guys before I drive home feeling slightly accomplished with myself. I decided that I needed something a little different. I had made an assumption in my mind that if I was to get in shape, I had to do it in a very specific way, but that was only because I didn’t have a goal in mind. Here’s the reality: without a goal, your workout experience of any kind will fail. However, finding a goal can be tough. I looked at the kind of fitness I thought I wanted and decided to pursue that. My biggest factor was that I wanted to be functional. If I was too big, I couldn’t run, and if I ran too much I probably wouldn’t be super strong. I looked at actors, NFL players, rock stars, and a few other high profile groups to find out who seemed the most balanced. I finally decided that out of all these groups of in-shape people, I wanted to try and be like a Navy SEAL. I decided that they looked like they had the most functional fitness out of anyone I thought of, so I went ahead and started training. Thinking back to my gym experiences, I knew I needed to do something differently. Out of this grew my home gym and all the workouts that go with it. After several years of this style of working out, I developed a functional fitness plan that really requires very little gym equipment. The most important part of this plan is the ability to stay disciplined and workout on your own instead of having to go to a gym to be motived. To be completely honest, it was tough at first, and still is tough, but I can tell you from experience that once you find the discipline to push yourself like this on your own, it creates a confidence that you can take anywhere. I used to hate going on vacations because it would mess up my workout schedule, but now I thrive on it. Once I opened up my mind, I realized that my fitness workouts were limited to my imagination. Okay, so far this has all been background: Let’s get to the workouts. Equipment Needed: Backpack, Rocks, and Determination. All you have to do is find a backpack of any kind, fill it to your desired weight, (I normally do around 50 lbs), and start walking. I would start with about 200 lunges counting every step and then go up 100 every other day until you get to 1000. This is a monster workout that has increased my overall fitness like crazy. Plus, I can take it anywhere I want. Don’t have a backpack? No problem. Just pick up a rock or a log and hold it in front of you. That’ll give you a killer bicep burn to follow up your shaky legs for the day. Equipment Needed: Rock. Log. Barf Bag. For this workout, find a nice stretch of dirt road or just go in your backyard. Start with the rock at your feet and do a burpee beginning with the pushup. When you come up, pick up the rock and go into a full goblet squat and then explode up and throw the rock as far as possible. Slow jog over to the object and repeat a couple hundred times. This will greatly increase your functional fitness and give you a total body workout. Also you might find that after a few throws you have the need to yack. Go for it. Purge the fast food from your body. Feel the freedom. This one is pretty simple. There’s no better way to get in shape than to use your own body. Decide on a desired number of pushups, situps, squats, and pull-ups to do and then do them. Do this literally anywhere. Find a nice tree limb or roof overhang sturdy enough and get to work. Yes, you might hurt your hands a little on some rough bark, but isn’t the point to get tougher? Just keep going until you hit your numbers or until the time expires. You’ll feel refreshed and centered after spending some time getting after it with nature. Even though I love home gyms, I do whatever it takes to go outside near my house. I understand that not everyone has access to wide open spaces, but almost everyone in America has access to some sort of dirt field or park or nature preserve within a short jogging distance. I found that this helped my mental health in addition to my body because it gave me a chance to unplug from the world for an hour or two and spend some quiet time alone. My “home gym” became wherever my nearest outside space was, which is actually a lot more practical than fitting yourself inside some structured square footage. Looking back on my gym days, I’m actually thankful that I had a bad experience because that pushed me away from the crowded, fungus-infested gym equipment and brought me out into the healthy outdoors. If some bad weather keeping you indoors? Not a problem. Go outside anyways. Chances are you’ll probably survive working out for a few minutes in the rain or snow. I guarantee it’ll bring a sense of accomplishment that is far greater than anything the local meatheads will get down the street at Golds. I know fitness is different for everyone, but unless you’re 100% satisfied with your current fitness, you owe it to yourself to try something new. Good luck getting after it.